I'm having constant problems with uploading files from AirDroid Web (on Chrome, Windows 10) to Android 7.0 (Samsung Galaxy S7) device's external SD card. Although I set SD card write permissions I get "No SD card write permission" popout all the time. When this happens sometimes I have to navigate folder up and down in AirDroid Web file browser to get this fixed and sometimes I have to close AirDroid Web session and reconnect to my phone and then is works. I try to upload 15 files 400 MB each to SD card folder by dragging them from windows explorer. On SD card there is 17 GB free space. 15 files appear in AirDroid Web transfer queue. If I try to upload the rest of the files to SD card in this state I get immediate Failed state and No permission error without transfer even starting. If I close AirDroid Web tab and then reopen it and reconnect to device I go to point 1, where 2-3 files will succeed and all others will fail to transfer. All transfers happen within LAN. Device don't loose connection to LAN mid-transfer - I checked it immediately after error and I still can browse all folders after it happens on remote client. I can provide you any additional info if needed. Update: I just ran some experiments and it seems the error always happens after the first file transfer is completed and there is a notifications about that. So even if I upload just 1 file it will always succeed but any subsequent transfer will always fail instantly until I restart AirDroid Web session. If I send multiple files - the first batch will get through but as soon as there is a notification all others will fail. 1. "So even if I upload just 1 file it will always succeed but any subsequent transfer will always fail instantly until I restart AirDroid Web session." 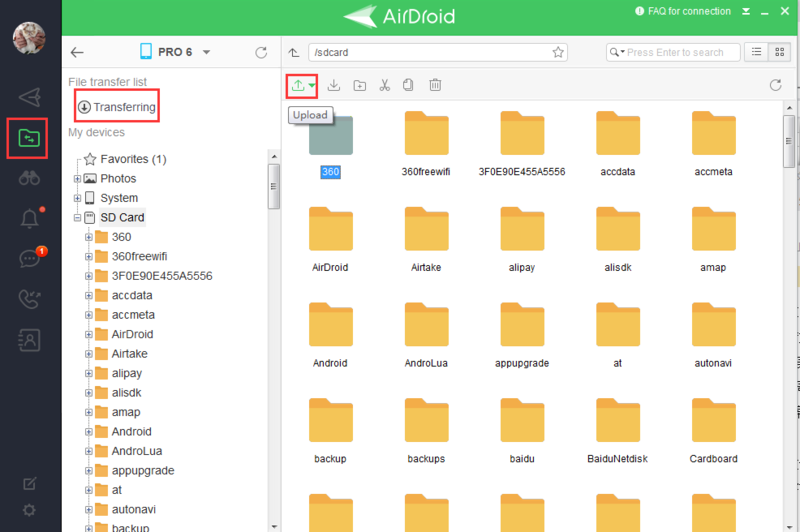 Is that AirDroid opening on your phone after first file successful transferred? Is that AirDroid on background? 2. Would you like to send us a screenshot of the error page for a further check? 3. Would you like to use desktop AirDroid in File management feature to see if it can successful transfer? 1. I assume that AirDroid is working in background in this state, because I can still navigate folders in AirDroid Web and can upload into internal memory. I just can't upload to SD card anymore until I restart session. There is "Ongoing session" notification displaying at this time. If I explicitly open AirDroid on device to foreground this doesn't change the behaviour. 3. I've installed AirDroid desktop and it doesn't have this problem so it's AirDroid Web specific. However I don't wish to use AirDroid Desktop because of it's poorly designed UI: there is no drag and drop feature for uploading files from Windows Explorer and File upload selector dialogue seems to use very strange API and it seems to be the only program among doesens installed on my PC which doesn't support Listary. The combination of this factors makes usage of AirDroid Desktop too tedious. P.S. : While running this tests for you I've discovered another AirDroid Web bug: if you create a folder on SD card via AirDroid Web you cannot upload files to it until you restart a session. P.P.S. While writing this report I've discovered that image upload function in this forum is not working when I tried to upload 1064KB png image the image upload modal glitched and stopped responding. Would you like to restart your phone and then to upload file on web again to see if it works. If it still fail, would you please send us your log file of your phone so that we can give you a further check? If this issue showed up on Apr 11, then please forward files named by 2018411 to us. Add support for folders other than sdcard Revue: No Portrait [The First Annual Android Police Andy Aw… How to launch and use standard Android "… How activate the GPS through the site? ?